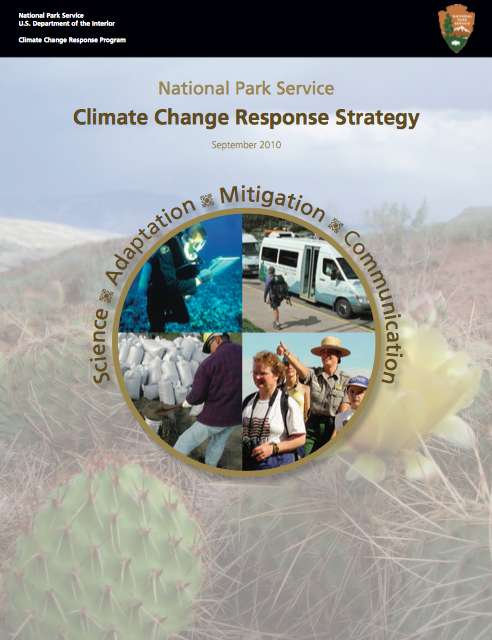 The NPS Climate Change Response Strategy provides direction to our agency and employees to address the impacts of climate change. It describes goals and objectives to guide our actions under four integrated components: science, adaptation, mitigation, and communication. The NPS will collaborate with partners to identify and monitor climate change effects in parks and to apply accurate and relevant science to management and policy decisions. In a changing climate, the NPS will adapt through the development of feasible and actionable scenarios and create a flexible framework for dealing with impacts1. We will reduce the National Park Service carbon footprint (the amount of greenhouse gases emitted through NPS activities) through energy-efficient and sustainable practices and integrate these practices into planning and operations. Finally, through clear directed communication, the NPS will raise employees’ and the public’s awareness of the implications of climate change and inspire them to take steps to address this challenge.